Our services include certified chimney cleanings and inspections, masonry repairs, chimney liners, dampers, caps, custom chase tops, dryer vent cleaning and reroute, etc., and much more! The first step is choosing the right company for the job, which is Chimney 1, the Only "1" to Call! How do you choose the right chimney sweep? First and foremost, start by doing your homework and make sure they are certified. BEWARE!! Virtually anyone without any training, education, or experience can call themselves a chimney sweep. Occasionally, sweeps advertise they are "certified", but they may not be. There are some people that call themselves a "chimney sweep" only because they own a few brushes, a vacuum, and a ladder. For your own safety, if they are not Certified through the Chimney Safety Institute of America, you should not use them. Certification is a personal credential, so be sure the particular technician coming out to your house is indeed certified. Would you take your car to a mechanic that was not certified? Would you go to a doctor that does not have a license? Why would you let a non certified chimney technician inspect or service your fireplace, the unit in your home that you use to burn wood or gas to keep your family warm? Certified chimney sweeps gain their knowledge through hours and hours of rigorous studying and testing. In order to become certified, these sweeps must pass a written examination based on fire codes and standards for the construction maintenance of chimney and venting systems. They also need be retested every three years to maintain their certification. Each individual on the list carries a CSIA photo identification badge which shows their certification number and expiration date. Due to our certification, we are providing our customers with proven solutions to their chimney problems. We know you want to receive the maximum value for your dollar, and contracting with a Certified Chimney Sweep, like us, is your best choice. It takes years of training and experience to be skilled in the trade. Preventive maintenance is always more cost effective than repairs that could have been avoided. Annual inspections are critical for a chimney's safety and yours. 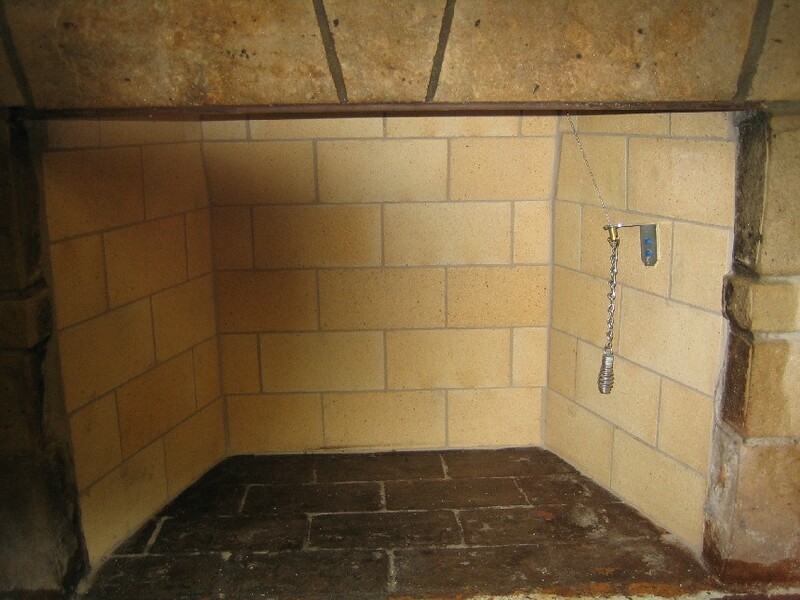 When you contact a chimney cleaning company, make sure they only send a CSIA Certified sweep to your home. Rest assured, all of our jobs have a CSIA certified sweep. How often should your chimney be cleaned and/or inspected? To put it simply, yearly. To make sure your system is in proper working order, we follow the recommendation of the National Fire Protection Agency (NFPA). This association is a non-profit organization that compiles data from thousands of fires every year and their findings provide the basis for building and fire safety codes. Their recommendation states "have a professional inspect the chimney, chimney connector, and other related equipment every year. Also the Chimney Safety Institute of America "recommends an annual chimney inspection and sweeping when necessary." There are two main factors that determine how often your chimney and heating unit should be cleaned. One is how many times you use your heating system a year. The second is what type of heating system you have. Most systems burn at a very hot temperature and therefore, create a layer of residue that can become flammable. When we clean your chimney, you can rest assured that you and your house will be protected from all dust and debris. We use a special vacuum that is very strong to capture dust particles. We take the time to clean all components of your system. Our full service cleaning takes approximately an hour. If price is your biggest concern, be careful to watch how long it takes another company to clean your system. If you feel the job was rushed, then something was probably missed and you most likely did not get a proper cleaning. We carefully inspect each and every component of your venting system. The picture below lists all the crucial parts we inspect. We are one of the few sweeps that take the time to carefully check all of these areas for safety and stability. Missing one of these areas could become a hazard. We pride ourselves on our knowledge and use of this crucial information for your safety and protection. Are you preparing to sell you home? If so, be sure to call us beforehand for an inspection so you can take care of any needed repairs to help your home sell more quickly. Do you need a different chimney liner? Yes. many chimneys are built with terra-cotta clay liners. These, however, can crack over time and cause leaking of water, heat, and gases, which will deteriorate your chimney. That is when we recommend installing one of our stainless steel liners that carries a lifetime warranty. A cracked or crumbling liner is a potential fire hazard and needs to be corrected immediately. 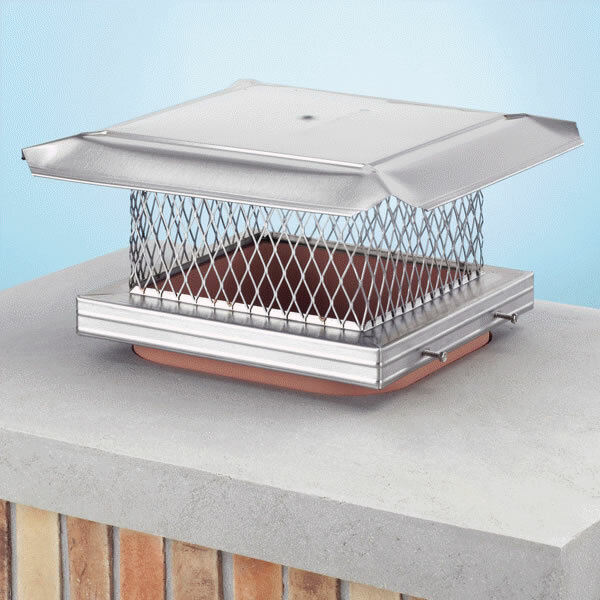 A chimney cap protects your heating system from excess rain, wind, debris, keeps sparks from coming up out of the chimney and keeps out critters that want to nest in your chimney. All of our caps are stainless steel and come with a lifetime warranty. When you get a minute, please check your chimneys and make sure they have a cap on them. If not, give us a call so we can inspect them and make sure your chimneys are clear of all debris and nesting. We can then install one of our stainless steel caps for your protection. Do you need a new chase top? First, you might ask, what is a chase top? It is a cover for the wood or metal framed box for a factory built chimney. It protects from rain and debris. It is a necessity for the life and maintenance of your chimney. Most homes when they are built and they have a factory built fireplace, the chase cover is made out of a galvanized material, which is low in cost to the builder, but it rusts and deteriorates rapidly. We replace these with a custom stainless steel cover. We take precise measurements of the chase to be sure of a proper fit. Our custom chase tops have crossbreaks to help shed water, a drip edge and a soldered collar. Our custom stainless steel chase tops virtually last forever. Whether you need a complete brick chimney rebuilt or relined, minor tuckpointing, sealing cracks in your firebox, or a chimney cap, we can do it all. 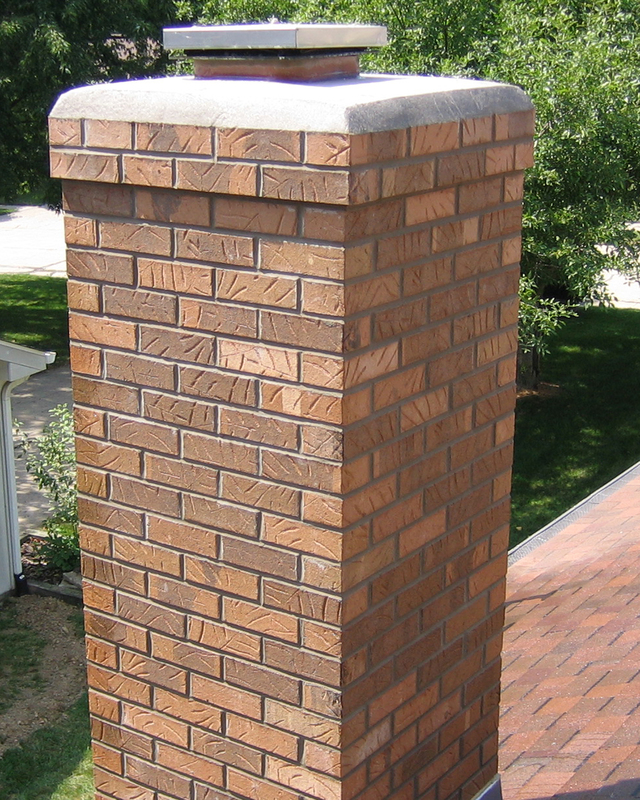 We employ one of the area's best brick masons, so you can count on the highest quality of craftsmanship. We can reline, rebuild and/or restore all types of chimneys. If you are having drafting problems, we will thoroughly inspect your system and explain what the best solution would be to get your system back in proper working order. We use stainless steel relining pipe, which comes with a lifetime warranty. If your fireplace needs replaced or just updated, we have many different options for you. Perhaps your brick chimney is crumbling and unsafe. Our highly skilled mason that can rebuild a safe and very attractive chimney for you. Possibly you just need some slight restoration. Our expert mason can refurbish your existing chimney to like new condition. Or perhaps you need work done on the inside of your fireplace. 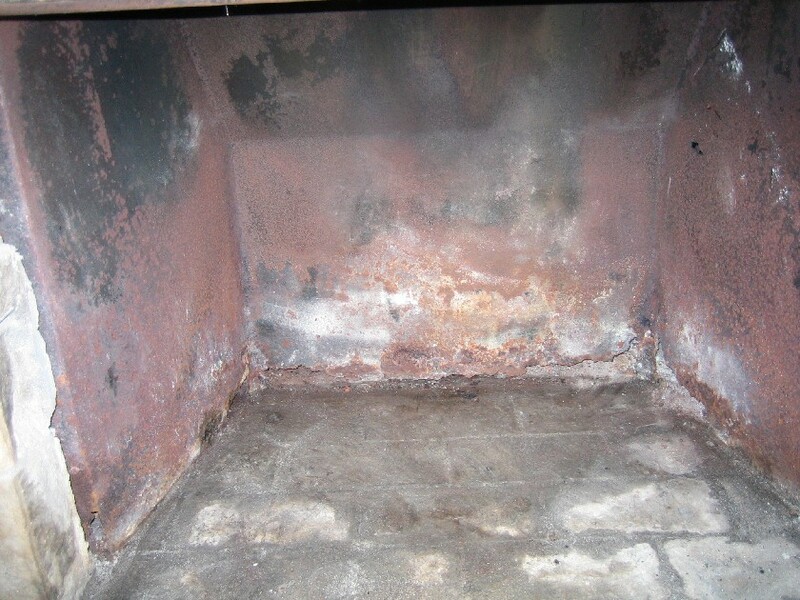 Below are examples of a completely rusted out firebox then rebuilt with new firebrick. We will write you a detailed estimate so you know exactly what work is needed and the cost involved. We take the time to examine the job completely and take proper measurements. Other sweeps may say they can beat our price if you let them see our estimate. But you should question "Why aren't they qualified to write their own estimate and what corners are they cutting to lower the price?" Call today for your FREE estimate on any repair. Most people think cleaning their dryer's lint screen is enough to keep their dryer running efficiently and safely. But, the fact is, lint builds up in the dryer's exhaust vent causing dangerous and costly conditions. How often do you do laundry? 1, 2 or even 3 times a week? When is the last time you had your dryer exhaust vent cleaned? The dryer creates moisture in the vent which causes the lint to build up especially with the use of soaps and softeners. Lint is highly flammable and easily cause a fire. Just like with chimney cleaning, make sure you use a certified technician, like us. We are Fort Wayne's Certified Dryer Exhaust Technician. Just like with our Certified Chimney Sweep Certification, we have hours of studying and testing. Then, in order to become dryer vent certified, we have passed a written examination based on fire codes and standards for the construction and maintenance of dryer venting systems. The cost of cleaning the vent yearly will pay itself off quickly with the amount of money you will save on your utility bill. Plus, you will not have to worry about excess wear on your dryer, especially if you have a new effiency type. Also, a clean vent allows the proper amount of air through and thus helps protect your heating element from burning out. 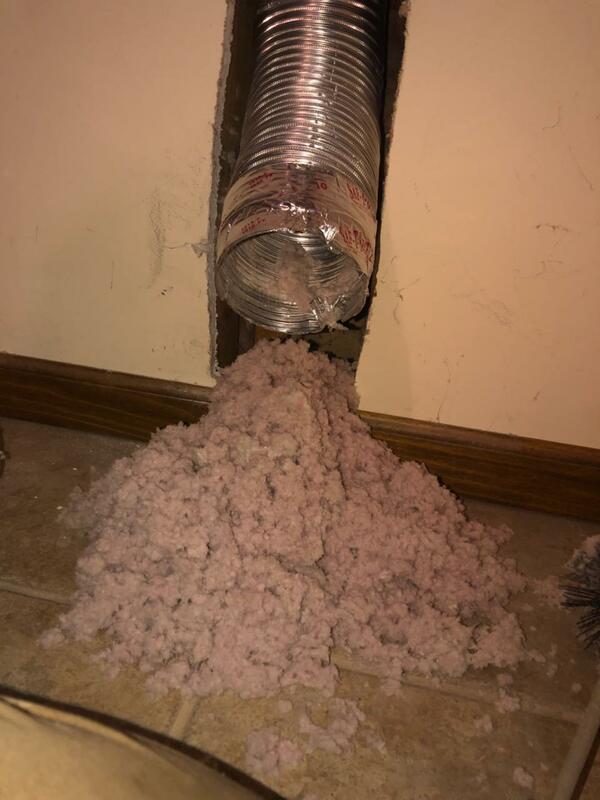 So, for many reasons, it is cheaper to maintain your dryer vent by having it cleaned once a year, than letting a build up of lint occur and paying for costly repairs. We use a unique pro spin method of cleaning which spins a brush through the vent and then use a high powered blower to push the lint out. This type of cleaning is the only way to properly clean a system and it is the most effective. If both of these steps are not taken, the vent will not be completely cleaned out. So, if your dryer isn't drying clothes like it use to, don't panic and think you have to buy a new dryer. Does my dryer need a new vent duct? Many homes still have the original white vinyl vent coming out of their dryer. This type of vent is highly flammable. If the lint catches on fire while the dryer is running, it will blow flames into this vinyl vent, catching it on fire. Highly unsafe. We always recommend replacing the vinyl vent with our flexible dryer vent duct pipe that is constructed of three layers of aluminum and two layers of polyester so it can withstand temperatures up to 275 degrees.